It's an age-old battle: cat vs. dog. Now, National Geographic and BuzzFeed's Jack Shepherd team up to settle the dispute once and for all! Documenting cats' superior abilities in such areas as artistry, athleticism, and intellect, Shepherd provides compelling insight into the fight for pet dominance. Perfectly pairing witty text with hilarious photographs and hard-hitting scientific facts, this brutally honest book culls the best evidence of the supremacy of cats (that the Internet can provide) to establish with definitive proof that individuals of the feline persuasion reign supreme over their canine counterparts. JACK SHEPHERD is the Editorial Director at BuzzFeed. 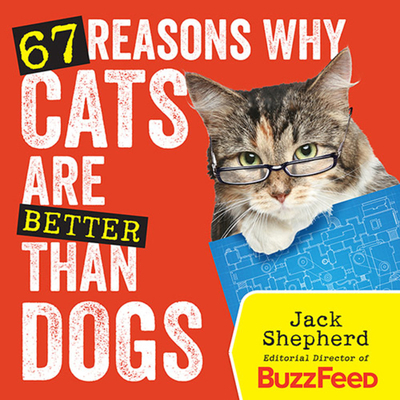 Shepherd joined BuzzFeed in 2008 and launched the site's Animals section in 2012. Still a regular curator for the site that has taken the Internet by storm, Shephard houses a collection of his BuzzFeed musings at buzzfeed.com/expresident. He currently lives in Brooklyn, with his cats and his regrets.